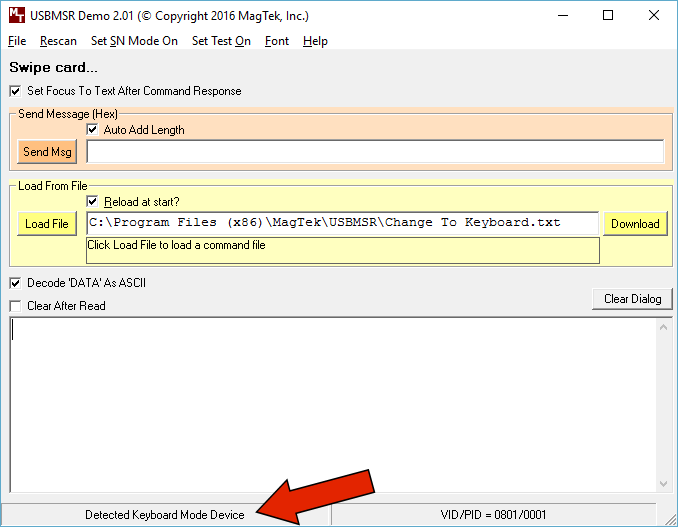 Magtek readers must be in Keyboard Emulation Mode. If they are in HID mode the swipe data may not be detected. Swipe the card into Notepad. If nothing appears, the reader may be in HID mode. You might also find that the light on the reader turns off shortly after plugging it in. Unencrypted Magtek card readers need to send the swipe data WITHOUT a carriage return between tracks. To test this, swipe your card into Notepad. If your card reader is inserting a carriage return between tracks, the swiped data will look like this. If your doesn't insert a carriage return between tracks, the swiped data will look like this. This is the ideal format. This is what the swiped data should look like to be compatible with our Shift4 i4Go V2 interface. 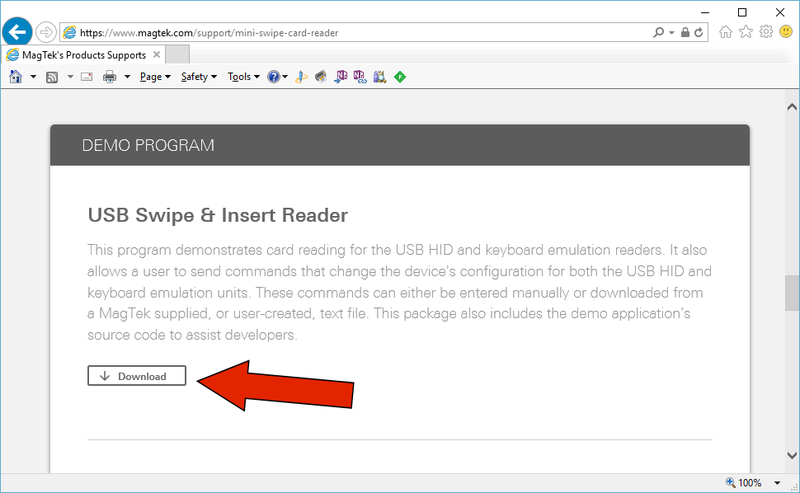 If your card reader is exhibiting any of the issues, above, you may be able to change this using an application provided by Magtek. The location of the webpage and application may change but this is the current location as of April 28, 2016. 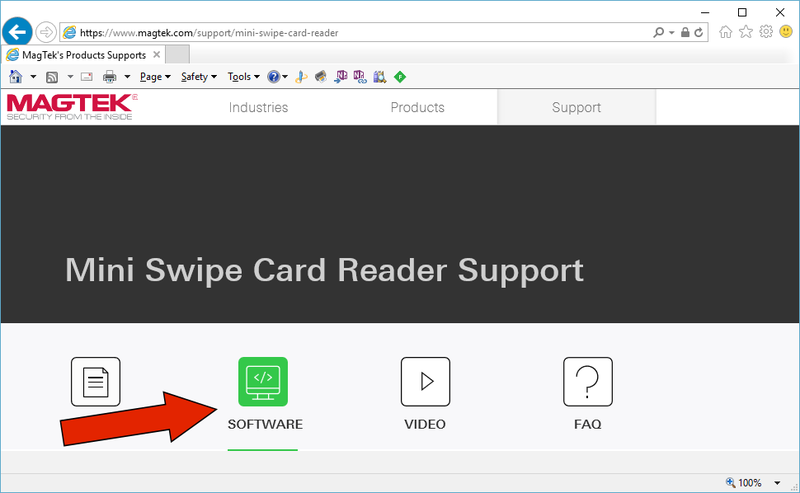 Once the link is open, click "Software"
Scroll down to the "DEMO PROGRAM" section and download "USB Swipe & Insert Reader". After installing it, run USBMSR Demo application. Wait for it to detect the device. If it's in the correct mode, the status bar will show Detected Keyboard Mode Device. This is the mode it should be in. If the status bar shows Detected HID Mode Device follow these steps. This is the wrong mode! In the Send Message (HEX) field, type 01 10 01 and click the Send Msg button. In the Send Message (HEX) field, type 02 and click the Send Msg button. You're done. Try swiping a card into Notepad just to be sure this fixed the problem. If the card reader shows a carriage return between the tracks, follow these steps. In the Send Message (HEX) field, type 01 E0 00 and click the Send Msg button. *This will place the device in HID mode and it will ned to be converted to KB mode.